Two Ticket Options to Choose From!Regular: This section is our standard General Admission seating. Food and beverages are NOT included with this purchase. Dinner Package Option: Dinner Package includes Front Section Seating, House Salad and choice of any Entree per ticket. Taxes and Gratuity are included in Ticket Price too! Any add-ons and extra purchases are NOT included and will be paid separately. With this package, you are NOT required to purchase two items inside the showroom the night of the show. ***There are NO refunds, exchanges, or credit given. Please make sure you are purchasing the proper ticket before completing your order. ***Allan Goodwin (a.k.a. “Badgerine”) connects with his audiences–getting them to appreciate the lighter side of their own lives relating his own experiences and observations. Well known as the “Badgerine”—that ADHD Dyslexic Superhero comedian who sends audiences home with cheeks in pain from laughter—Allan Goodwin brings the “disability” of ADHD into an entirely new light. A winner on America's Funniest People, Allan has been interviewed on The Billy Bush Show, and he has been seen in several PBS commercials. 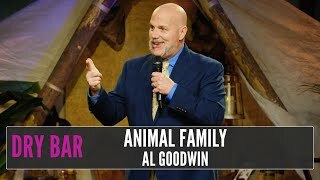 Al regularly headlines comedy clubs, theaters, cruise lines, resorts and military bases, and also performs for large venues and corporate events. He was featured on the national TV show LAUGHS on Fox, and was a 2014 Finalist and a 2015 First Place Satellite Winner in the World Series of Comedy. Al was the host of the 2014 Television, Internet and Video Association (TIVA) Awards Gala at the National Press Club in Washington DC. He also represented the East Coast in the HBO's Lucky 21 Contest, a Las Vegas Comedy Competition. If you haven't experienced an Allan Goodwin show, put this on your “must do” list and bring some friends--because at an Allan Goodwin show ... laughter is always guaranteed.